Would the Shanghai citizens be able to resist pushing to get out of the elaborates door turnstyles as found in the casinos or would they rush forward in their excitement to shop and gamble and surely get stuck as the doors stop when touched even lightly….Caution: follow the directions or risk being caught until a security guard can spring you. Would the Nearly Naked Cowboy fly in Shanghai? He wasn’t nearly as naked as the original Naked Cowboy in Times Square that liked to strum his guitar in front of where I used to work but, still, I laugh out loud when I think of how often the Nearly Naked Cowboy would be photographed if he were to pop up in the middle of the fancy Xintiendi courtyard….I think he would be a crowd pleaser for sure. What do these cities have in common? Well, an obsession to light up buildings at night, serve grandiose buffets, perform lavish acrobatic shows and shop at Prada, Prada, and more Prada. There is also a mutual love of water, whether in koi ponds or soothing waterfalls or over the top volcanoes, water features are everywhere in both cities. In Shanghai, the few homeless you do see on the street begging are quiet in their demands, shaking a cup to get your attention vs. Vegas where the homeless travel in groups, strategically placed along the Strip with signs that read “Sugar Mamma needed” or “Need Weed”–can’t imagine that on the streets of Shanghai for some reason. 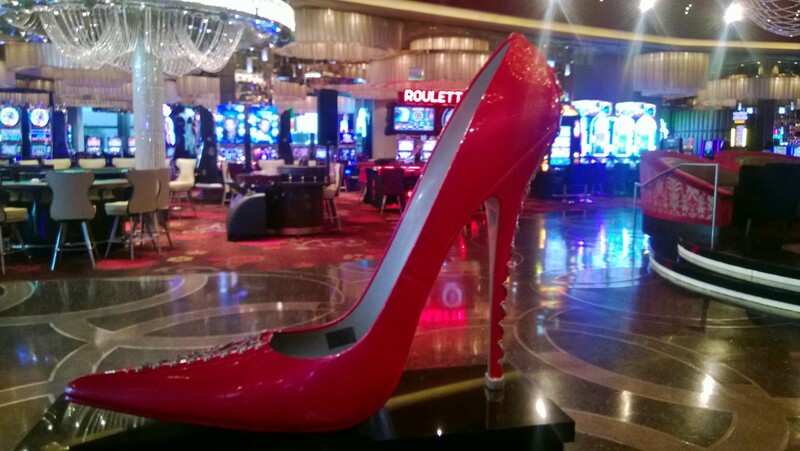 One unique idea I saw in Vegas would do well in Shanghai where the lovely fashionistas wear their stilettos to work. 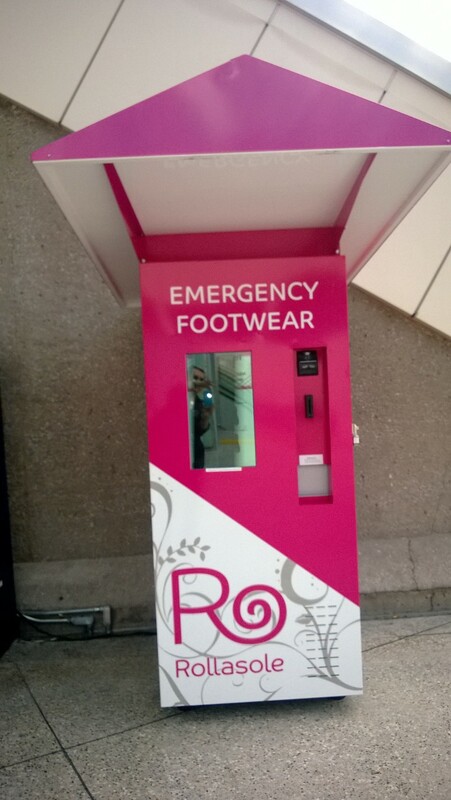 Imagine dancing the night away and then, feet bleeding, you just can’t take another step in those heels..but, wait…there is a convenient shoe dispenser right on the street that beckons you for a hideous yet comfy alternative. The Vegas Strip and Shanghai have hordes of people walking the streets and also have great wealth positioned right next to great poverty. When I first saw the name of the apartments across from my office, I did a double take–Richgate–that is really the name of the apartments and is descriptive of the super luxury apartments that are over $6,000/month U.S. in the heart of the Xintiandi area. Just a block away, locals live in one room with no inside plumbing and cook on the street with oil drums heating their food. I wonder how the locals feel about the Richgate residents. Do they resent their wealth? Do they welcome their money into the local economy? Do they aspire to be like them or consider them a necessary evil? Do they make fun of their decidedly different lifestyle? The same in Vegas-do the locals who work at the casinos resent the wealthy throwing their money away at the craps tables or do they welcome their business, creating jobs that do pay decently. Thousands of miles apart, Shanghai and Vegas, but the wide disparity in the income levels is still the same no matter where you live in the world.